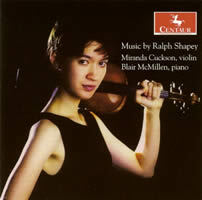 Ralph SHAPEY: Five for violin and piano (1960)*; Mann Soli for solo violin (1985); Partita for solo violin (1965); Etchings for solo violin (1945); Millenium Designs for violin and piano (2000)* (rec. 2006). Miranda Cuckson (vln), Blair McMillen* (pno). Centaur CRC 2900 (http://www.centaurrecords.com/). Distributed in the US by Qualiton (http://www.qualiton.com/). Shapey’s violin scores limn a consistent portrait, a thorny Partita to the vigorous Mann Soli. Cuckson tosses it all off with ripping style. 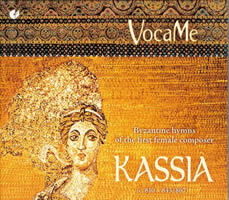 KASSIA: Byzantine hymns from the first female composer of the Occident (rec. 2009). VocaMe: Sabine Lutzenberger, Sarah M. Newman, Gerlinde Sämann (sop), Sigrid Hausen, Elisabeth Pawelke (mezz-sop), Natalia Lincoln (alt); Michael Popp (dir. & var. instr. ), Johann Bengen (santur). Christophorus CHR 77308 (http://www.christophorus-records.de/v2.php). Distributed in the US by Qualiton (http://www.qualiton.com/). Purchased from JPC (http://www.jpc.de/). Twelve centuries after her birth, Kassia’s hymns remain in use. VocaMe excels in unison or solo; mark the long-breathed drones. More needed. 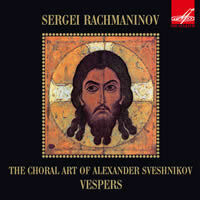 “The Choral Art of Alexander Sveshnikov.” Sergei RACHMANINOV: Vespers, Op. 37 (1915) (rec. 1965). Klara Korkan (mezz-sop), Konstantin Ognevoi (ten), The State Academic Russian Choir USSR, Sveshnikov (cond.). Melodiya MEL CD 10 01365 (http://www.melody.su/eng/). Purchased from rarervnarodru123, Moscow (http://myworld.ebay.com/rarervnarodru123/). Taped for the work’s 50th year. Sveshnikov’s grasp (and singers!) convey the stamp of a unique occasion. Not sold inside the USSR back then. Valentin SILVESTROV: Post scriptum (1990-91)1; Epitaph (L.B.) (1999)2; Drama (1970-71, rev. 2002)3 (rec. 2007). Jenny Lin1, 2, 3 (pno), Cornelius Dufallo1, 3 (vln), Yves Dharamraj2, 3 (vlc). Koch International Classics KIC-CD-7740 (http://www.kochentertainment.com/). 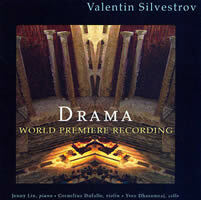 Drama stages a dialog of Silvestrov’s avant and present-day selves; their disconnect rings true. The cast lends great focus to the gestures. 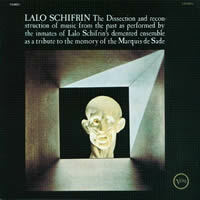 Lalo SCHIFRIN: The Dissection and reconstruction of music from the past as performed by the inmates of Lalo Schifrin’s demented ensemble as a tribute to the memory of the Marquis de Sade (rec. Rudy Van Gelder, 4-27 & 28-66). Schifrin (pno, hpsi), Ernie Royal, Clark Terry, Snooky Young (tmpt), Urbie Green, J.J. Johnson, Kai Winding (trmb), Jerome Richardson (ten sax, alt fl), Ray Alonge (fr hrn), Gene Bertoncini (gtr), Richard Davis (bs), Grady Tate (drums), Rose Marie Jun (voc), and strings. Verve Japan UCCU-9624 (http://www.universal-music.co.jp/). Purchased from CDJapan (http://www.cdjapan.co.jp/). The Marat / Sade title appealed in 1966, but I recalled it as less like Schifrin’s Gillespie or movie gigs than it now seems. Disappointing.